Story: Haroun El Poussah is the benevolent, and not too bright, Caliph in Baghdad. 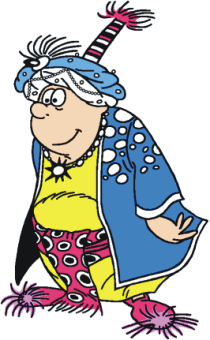 Background notes: When Goscinny and Tabary created the series about the Caliph and his Vizier who wanted to be the new Caliph, Haroun El Poussah (Haroun El Plassid in English) was supposed to be the main character, and the series was named Calife Haroun el Poussah. The renaming to Iznogoud happened gradually from 1968 to 1972, when the series moved from Record to Pilote. Like Dilat Larath, Haroun El Poussah has been with Iznogoud from day one through all the media that the comic has been transferred to. In the cartoons the voice was done by Jacques Villeret, who also played the Caliph in the movie.